Do you know what I love best about having school aged kids? I love it that for approximately 6 hours x 180 days per year, the responsibility of teaching & caring for my children is lifted off my shoulders and shifted to the very capable hands of all their wonderful, hardworking teachers. Much as I adore my boys, I am so happy when they go away for a few hours. I get to finish my chores in silence. I run errands without being forced to discuss details of shows like Naruto and Beyblade . I attend my favorite fitness classes and occasionally meet a friend for lunch. Yup. Love having school aged kids & being a stay-at-home mom. And to top it all off, while I’m off enjoying my 6 hours of alone time every school day, I know that my boys are having a fabulous time and getting an awesome education at our local public school. Here’s an example of one of the amazing things that go on at school. Last week Ethan presented me with an invitation to attend his class’s Poetry Cafe. Every child in E’s class had written a series of poems, typed his/her own poems up, decorated every page and then bound the poems into a book. During the actual Poetry Cafe hour, each child read one original poem aloud to class and parents. Then we all had a chance to browse through the rest of our children’s poems. I was very impressed with the entire project. The poetry cafe was the perfect culmination of so many parts. 29 first graders. 1 teacher. The idea of poetry. Haiku. Rhymes. Acrostic poems (E taught me that name). Enthusiasm. Creativity. Perseverance. Writing. Typing! Endless patience on the part of their teacher. Joy over their accomplishments. It was wonderful to watch every child share his/her poem. Simon came to participate in E’s Poetry Cafe. In true Simon form, he jabbed me mid-way through the readings and whispered that he couldn’t understand a word anyone was saying into the microphone. I jabbed him back to hush him. So what if we couldn’t actually understand their readings? It was enough for me to witness every child’s pride in the entire class’s hard work. Ethan prepared four poems. I’m not going to subject you to all of them, but I had such a reaction to his “Stuffed Animals” acrostic poem that I’ve just got to share it. I had a good laugh when I read the first set of words. E adores soft cuddly stuffed animals. He’s collected a giant bucket of them and loves every single one except a little mustard colored orangutan guy which happens to be my favorite. E’s been harassing me to get rid of that thing for a long time. It cracks me up that he couldn’t resist bringing it up again in his poem. And then I felt my heart swell up as I read the second set of phrases. Because I often call E my teddy bear as I smash him to me and pretend to go to sleep holding him. That’s our joke when I’m tucking him in to bed at night. But in that one line, “Listen to the stuff inside them,” I know how much E loves me back. So I guess that takes me back to another great thing about having school aged kids. They not only go away for a few hours every school day and learn … but sometimes they write something that feeds my soul and breaks my heart all in an instant. A simple classroom exercise ended up revealing something so meaningful to me that Ethan never would have thought mention at home. What a lovely surprise. School aged kids. Love them. Here it is! My first attempt at yarn bombing. What do you think? Just in case you’re wondering – yarn bombing is a kind of graffiti using yarn or fiber instead of paint or chalk to create colorful displays (yes, I’m paraphrasing from Wikipedia). I’ve been itching to try it for quite some time, but couldn’t decide what I wanted to encase in yarn. Something simple. Something functional. Something at home (no wrapping up trees or park benches for me). 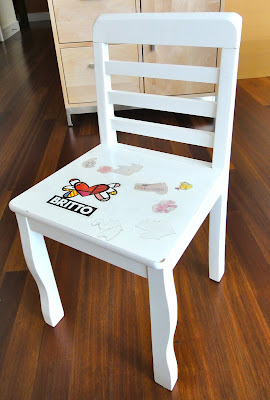 I decided to start with a child sized chair when I came up a picture of a yarn bombed chair from Lion Brand Yarn. Luck was with me when I salvaged this little chair from my apartment building’s trash pile. Love it when my neighbors toss out things I can work with! I hauled the chair back upstairs, peeled off the stickers, gave the chair a good scrubbing and then set it aside until I had the right combination of yarn to pair with it. 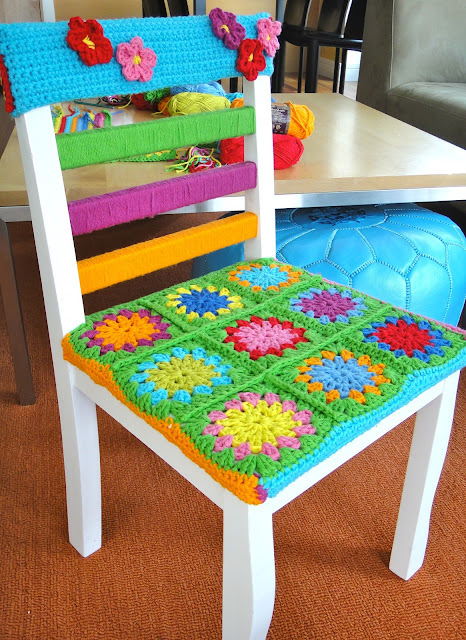 Around the time I found the chair, I was also learning how to crochet granny squares. I intended to make the “Granny Greenbag” project from that Craft Activism book I told you about a few months ago. I chose to use the cheerful Lion Brand Kitchen Cotton yarns for the project, bought all ten colors and started churning out granny squares. Then, as it so often happens, I changed my mind mid-way through the project and decided I’d rather use the granny squares on my chair instead of making a shopping bag. So I pieced the squares together and crocheted edges that would be folded under and attached under the wooden seat. I used a staple gun around the edges (under the seat) to secure the crocheted seat cover to the wood. Then I simply wrapped yarn around the three chair slats. 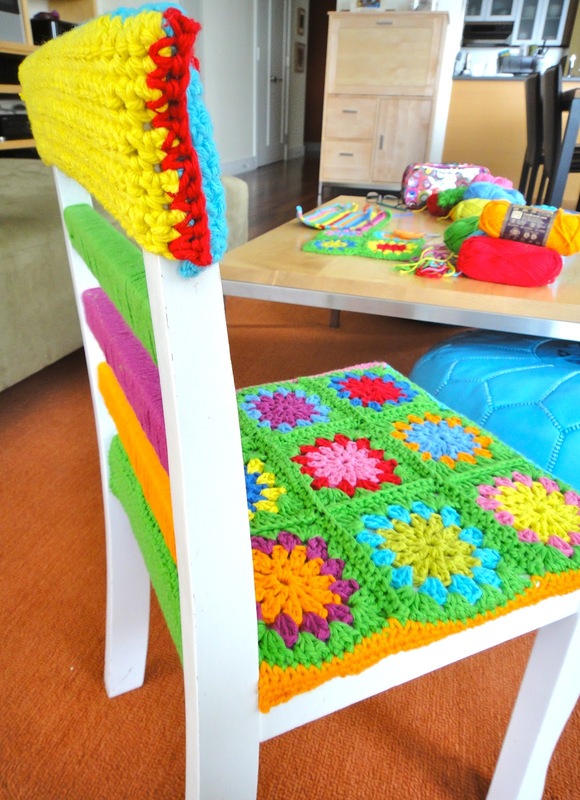 I crocheted a little turquoise and yellow cap to slide over the top of the chair back. As you can see, I had a little trouble piecing the rectangles together… yes, it’s crooked, but still, I think the red contrast looks right against the blue and yellow. Lastly, I used one of the flower patterns I found on Pinterest to create a few flowers to sprinkle across the back of the chair cap. Initially, I’d planned to yarn bomb my chair much as the Lion Brand chair had been – 100% covered in yarn. However, I decided leaving parts of the wood exposed actually lent a more summery feel to the finished piece and contrasted beautifully with the bright yarn colors. So there it is. My first stab at yarn bombing. Fun. A little challenging to figure out the necessary shapes to make the seat cover. Definitely time consuming. But worth it, because now I can say that I’ve yarn bombed! And, since I stopped when I did, I have plenty of left-over yarn and a couple of really exciting ideas about what to do with it. Would love to have another crocheted item or two to share with you before the week is out, so I guess I should stop blabbing and get crocheting! Prior to trying the recipe I’m sharing with you today, I did not care for the stuff. Say fruit salad and I envisioned a plastic cup with too many chunks of tasteless, underripe honeydew and cantaloupe, not enough pineapple and a few random red grapes tossed in the mix. Not particularly appetizing. Some fancier fruit salads mix pineapple, strawberries and blueberries. Or maybe just a selection of berries. Much better. But still not something I’d wake up and think, Wow! I could go for a bowl of that fruit salad! Nah. Fruit salad just wasn’t my thing. Until I went to my friend’s home. She asked me to help reconfigure her living room (some of my buddies have been requesting mini-rearranging sessions ever since I blogged about the Millie Project. Yay!). When I showed up to her apartment, she surprised me with a delicious home-cooked breakfast – including this yummy fruit salad (Thanks Connie). I ate three servings of it at Connie’s. On my way home from her place, I stopped at the store to pick up ingredients to make it for my family. It was a huge hit. I’ve made this salad a half dozen times since and each time it disappears faster than the the last. There’s only one little secret to this delicious snack. Slice the bananas first. Then soak them in the orange juice. 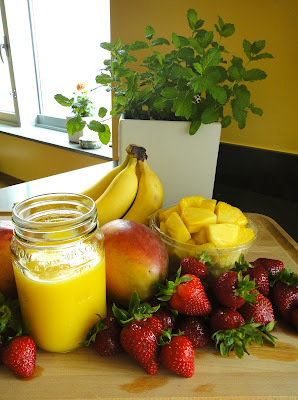 I use a big square container, so it takes only 1.5 cups of orange juice to cover the bananas. You might need a little more, depending on your mixing bowl. Once the bananas are soaking, chop up the other 3 fruits. Be sure to use sweet ripe mangoes. I try to “ring out” as much of the mango flavor as I can, so I slice every last bit of the mango off that pit. The last little slippery bits will blend in with and thicken the juice. Toss all the fruit. And that’s it! This salad will last a good two days. You might even prefer to let it sit overnight before eating so all the flavors can soak in and blend together. I love the bold, bright flavors of this combination of fruits. The bananas tie it altogether with their creamy sweetness. I really think it’s like eating a bowl of sunshine. This is one fruit salad I actually do wake up and think, Wow! I sure would like a bowl of that stuff! Whenever they find interesting buttons and beads lying about, they bring them home to add to my collection. Of course, it’s not actually the buttons that make me happy. It’s the fact that Si and E stopped whatever they were doing in that moment to think of me. I love it when their warm little bodies sidle up next to me and their sticky grubby hands dig out whatever treasure they discovered and brought home for me. Wonderful moments. But it’s also great because I really do use many of those scavenged goodies. When my friend, Melissa, came over for coffee & crafts the other morning, I opened up my craft closet and started pulling out all my various supplies. The container of buttons. The jar of beads. Plastic lanyards my brother begged me to take because he couldn’t stand cleaning up all the piles of cut up plastic his four year old insisted on making (snip snip snip all over the house). A spool of hemp. Embroidery floss. Discarded jewelry from friends (thank you!). Our crafting theme was campy summer bracelets. Melissa went straight for the hemp. I pulled out an old how-to manual for her and she was soon engrossed in teaching herself how to tie square knots and half knots. Until I remembered a tutorial I’d pinned on pinterest weeks ago – button bracelets. I took a quick look at the simple instructions and decided that this, indeed, was exactly the right craft to suit my mood. I didn’t have the leather or cotton cords the tutorial suggested using. But I did have a ball of hemp and a mound of buttons. Good enough. And then, it was just picking the right combination of buttons. Which is actually a relaxing thing to play at while enjoying conversation with a friend and sucking down a third cup of coffee (yes, I drink a lot of coffee). All wooden buttons? A splash of color? What if I added one leather button? Or perhaps one bronze colored metal one? In the end, I made one bracelet for myself and one for Melissa using 7 buttons on each and tying knots between buttons. A super basic and easy craft. But fun, nevertheless. Since my new bracelet complemented my yellow cotton summer dress, I wore it for the rest of the day and even earned a few admiring comments on it. I think this bracelet works on its own, but would also look great if paired with one or two plainly woven hemp bracelets. Perhaps I’ll be working with that hemp soon, after all. Look what we came home with from our trip to the antique store! He measures 16 inches in height and 22 inches from nose to tail. 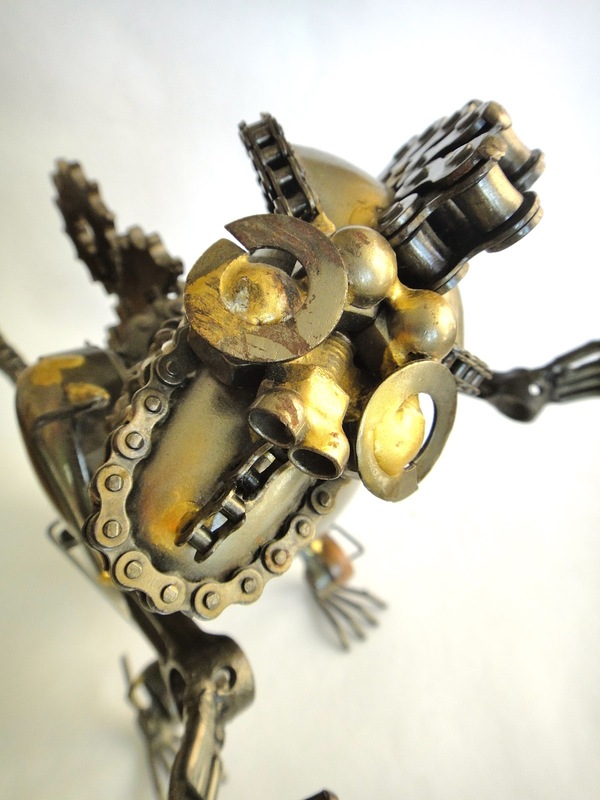 This awesome piece of art is made from recycled metal pieces. Simon spotted Bikezilla half hidden behind random metal containers and junk. We have no idea (yet) who created him but we thought him such a wildly wonderful piece of upcycled inspiration that we couldn’t leave the store without him. Look closely and you’ll see that someone patiently soldered (welded?) screws on as teeth. The head swivels. I think the skull used to be a garden faucet nozzle. Did his jaws start out as spoons? The arms move from the shoulder joint. I wonder what the hands originally were? Somehow, Bikezilla actually has an expression! 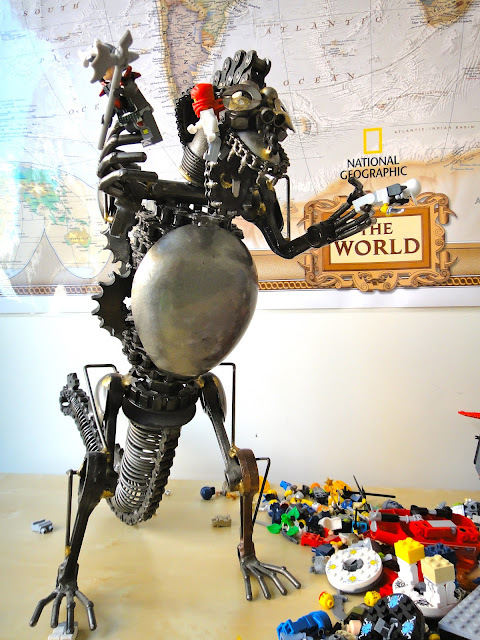 I think his torso is made from bike gears. And that’s a bike chain running down his back, right? His spine and tail swivel as well. This thing is amazing. 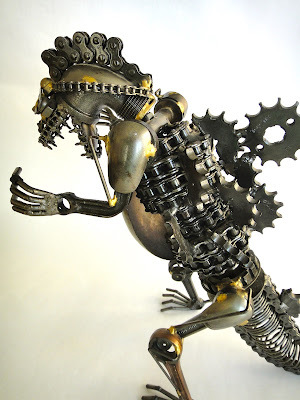 Simon and I spent a lot of time studying the intricate work that went into designing and creating Bikezilla. So Simon has been collecting bits and pieces of metal since kindergarten. Soda can tabs, screws, nails, washers and such find their way into his pockets and then all over our apartment. Quite frankly, it drives me nuts to find the odds and ends lying around. I’ve not worked with metal before and am not drawn to it as Simon is. 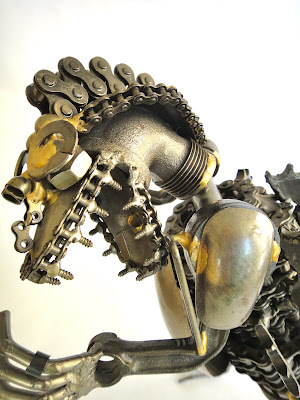 I never got particularly excited when he’d expound about his metal collection and the things he could make with it all. I just didn’t share his vision. Except, now, we have Bikezilla. And I think I’m getting it. 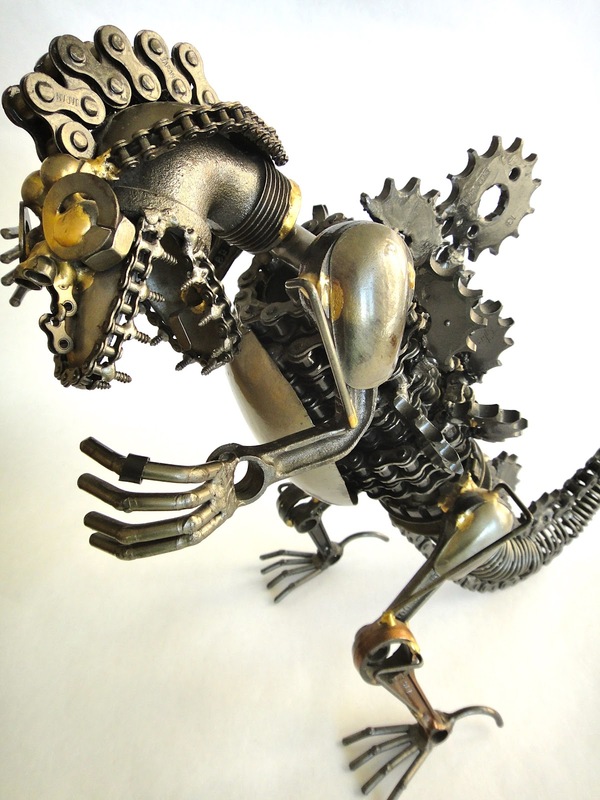 In fact, I’m fired up over what can be done with scrap metal. Si’s way too young to learn welding, but perhaps we could experiment with industrial glues? Or at the very least, I suppose I could stop tossing the metal bits out when I stumble across them (sorry, Si) and help him figure out some kind of system to store his findings instead? Simon, Ethan and I were simultaneously fascinated and creeped out by Bikezilla. Last week, the boys fought to play with him by day, but then begged to have him removed from their rooms at bedtime. They seem to have overcome their fear of him now, but last night I dreamed he was scuttling around the house after me…. I sure would like to know who created Bikezilla. If you happen to recognize this work, please let me know who the artist is!